Your currency settings can be adjusted to your needs in AliDropship => Settings => General. 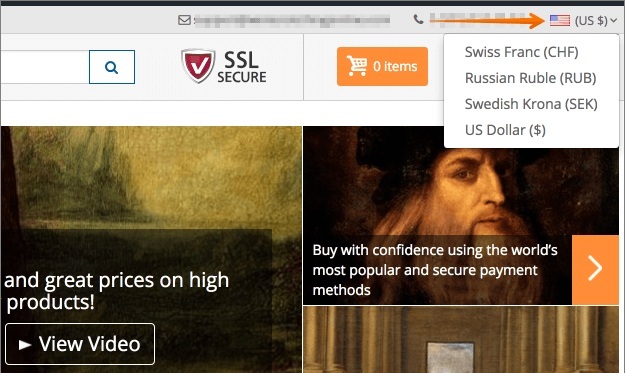 AliDropship Plugin uses US Dollars as a primary currency set by default. You can change it if you plan to work with another currency. In this case all the product prices in US Dollars will be automatically converted into the selected currency according to Google Finance converter. Up-to-date exchange rates can be found next to Currency settings. With AliDropship plugin, it is possible to add more currency options so that your customers can choose necessary currency from the drop-down menu in your store. Database currency is used by the software as your default currency for payment gateways. You should not change this currency once it has been set up as this might negatively affect the way your payment gateway works.